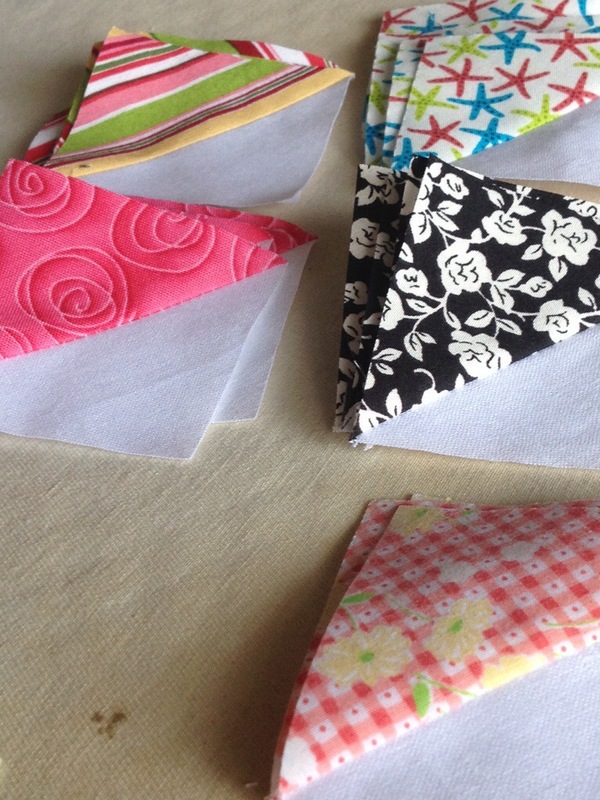 I am still working on making all the HSTs I need for my sashing! I think it’s totally worth it but I have been living in the HST hinterland (aka sashing sweatshop) for a week straight! My quilt top is fully assembled with two borders now. 🙂 But it needs some more width or it is both too narrow and too short. Whoa is me. I am likely going to need another 200 HSTs for the last element of piecing before moving on to doing the finishing border. 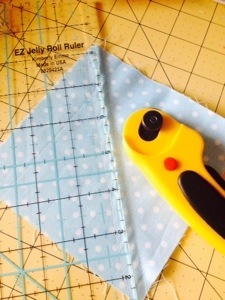 This time I’m going to try something fun–curved corners! It takes bias binding but I think I can handle it. I’ll take pics and post about it when I get to that stage! I don’t know about you, but I love quilt bindings that are different. It’s cool to do something that lends itself to the design in your piecing rather than do a simple straight edge, straight grain binding. I got a bee in my bonnet about this particular look for this quilt because of all the appliqué and the curved bias strip stems on the flowers. Short of doing a full-out scallop, I thought I’d just go ahead and do it this minimalist way. 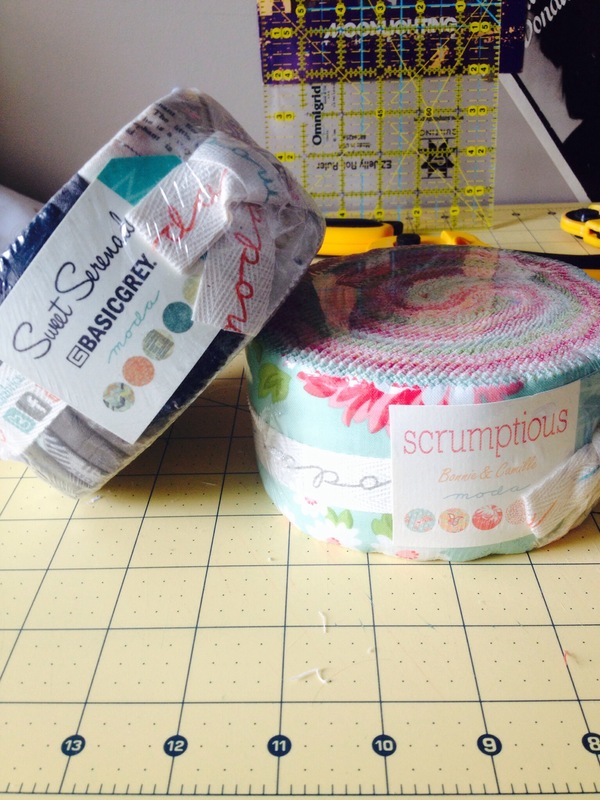 I am also lusting after my latest acquisitions–two very different jelly rolls. 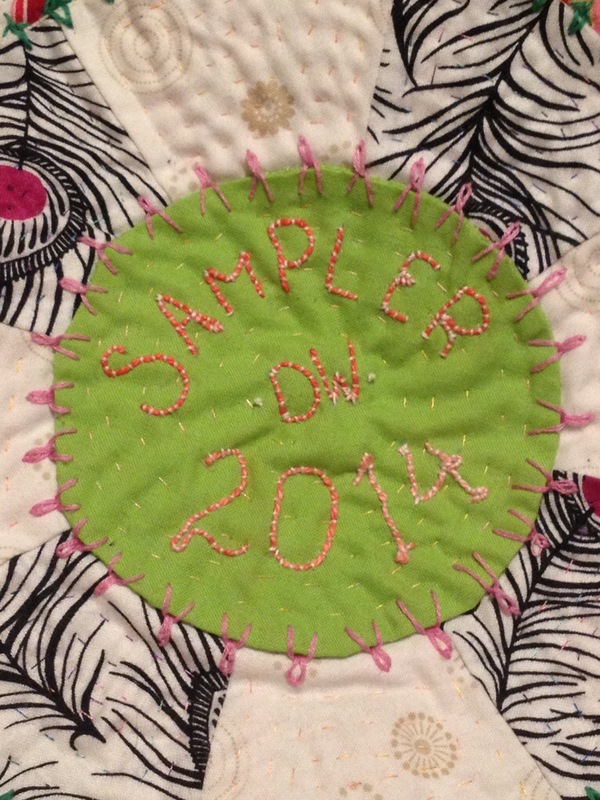 One is Scrumptious by Bonnie and Camille, which is super cute and springy. Then I got a decidedly more masculine jelly roll, Sweet Serenade, by Basic Grey. It’s got more greys, teals, blacks, and some soft neutral strips. I haven’t really secured any ideas in my head about what to make with them. I was thinking about maybe doing a really cute Irish chain pattern that’s got some curves with Scrumptious, but then I got Sweet Serenade and I’m thinking that would make an awesome and unexpected Irish chain. I find myself thinking about patterns that are unexpected when paired with modern fabrics instead of the usual traditional stuff. 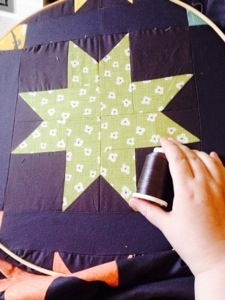 Here’s a traditional looking stars quilt. I made it decidedly modern by using a charcoal grey Kona solid as the background and an urban jelly roll called Bluebird Park by Kate and Birdie. There’s the very traditional like the double wedding ring. Very beautiful. Nothing wrong with it. But I don’t want my patchwork (or quilting, for that matter) to make the house look like Downton Abbey. I wouldn’t be able to keep a straight face in my own home if I did that! I want it to be modern and loads of fun with texture both visually and physically. I have every intention of making this pattern but I have yet to decide how to go about my palette. 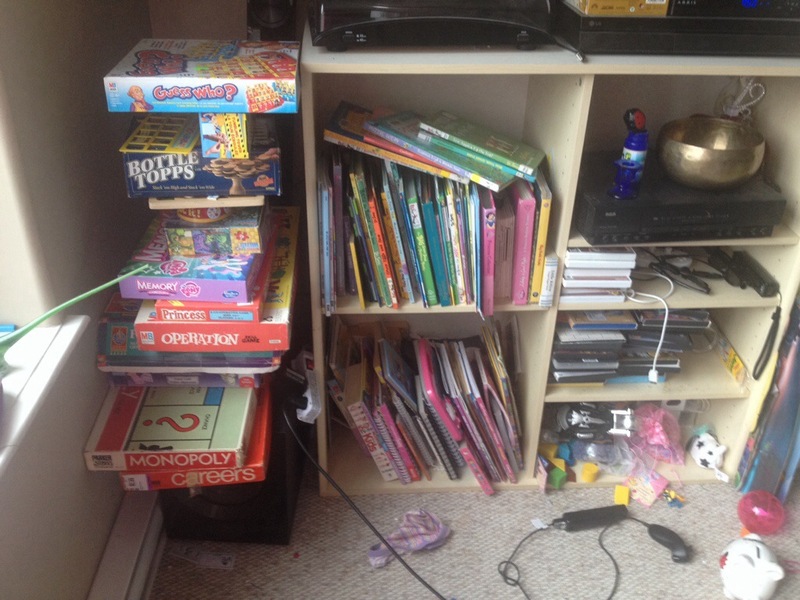 That is my CD rack/jumble of saved selvages and jelly roll wraps. It’s one way of going about my palette choice. Each wrap looks neat and has colour ideas on them! So that’s where I’m at, guys. 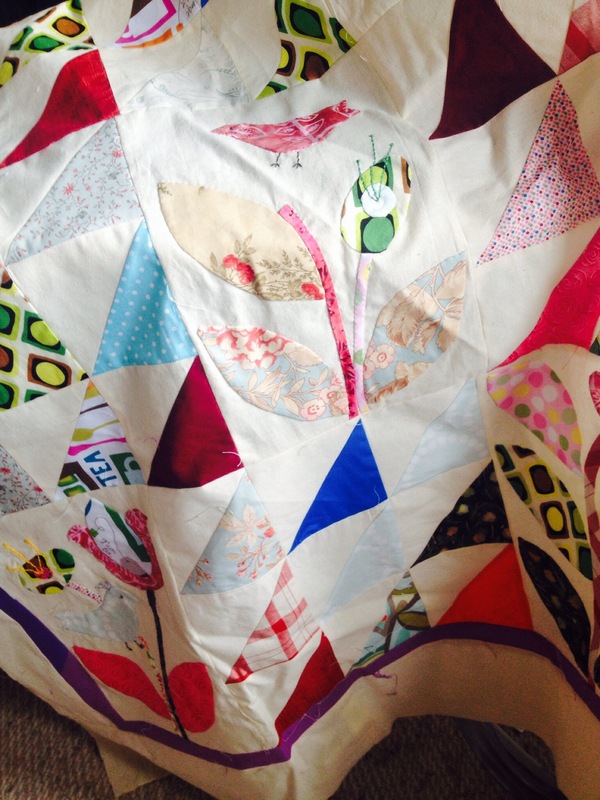 Lots of piecing and quilting to do! 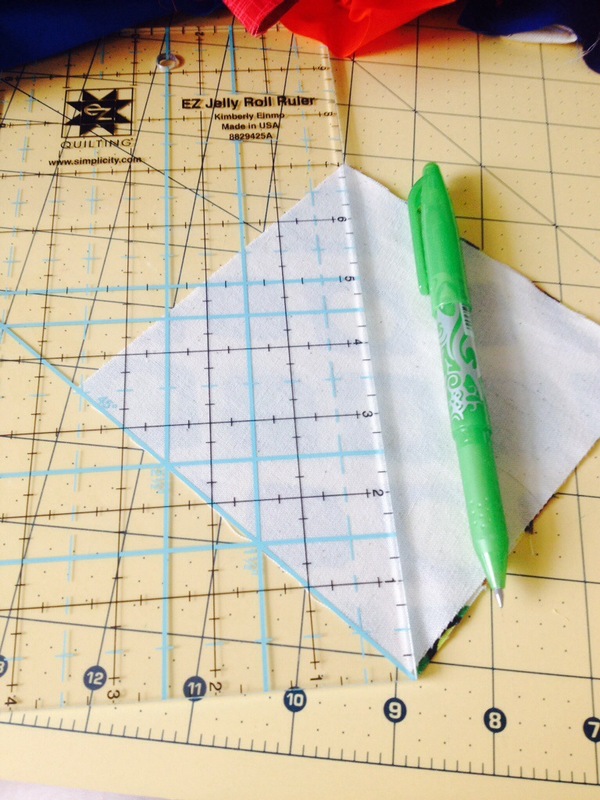 All quilters, regardless of modern or traditional bent, are going to need to know how to make half square triangles (HSTs). 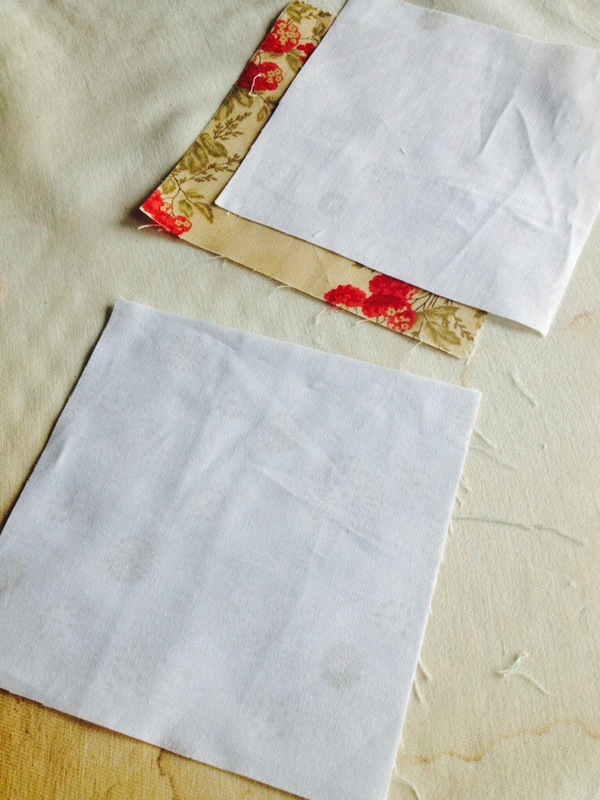 So since the quilt I’m working on now requires over 100 of them, I thought I’d share the two methods I’ll be using. Step two: after doing this to the required amount of squares (this method yields two HSTs per square) sew 1/4″ to the side of the line. Not on the line! This is also a great opportunity to switch to a double sided 1/4″ piecing foot. Step three: Now you can chain piece everything. After sewing this first seam, flip your chain around as though forming a circle and sew another 1/4″ seam to the side of your line. Step four: now take your ruler and cut along the line. Now you have two HSTs ready to be pressed. Everyone’s got their opinion about pressing. Seam open, to one side, starch or not, steam or not. This is my way of pressing and you take it with a grain of salt and do what you like best. First I take the cut triangles to the board. Then I give them a squirt of whatever’s on hand. Today I have Mary Ellen’s best press, but sometimes I use starch. Then I take my steam iron (it’s a Rowenta pressure iron with a steam compartment separate from the iron itself. I love this iron and highly recommend it!) and put it on the seams like an elephant foot. 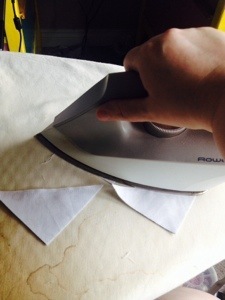 Then it’s safe to open the HST up and press the seam to the side and give it some steam. Trim your dog ears and you’re done! 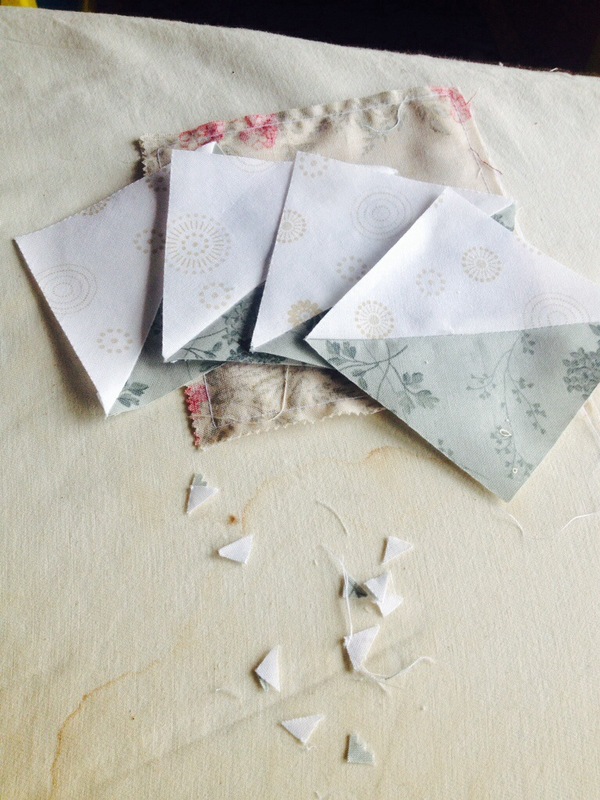 This method is cool because it yields four HSTs with each unit. The difference being the HSTs are smaller. So if you’d like larger units just start with bigger squares. 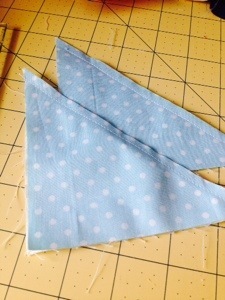 This method is perfect for creating borders and you needs lots of HSTs in a hurry. 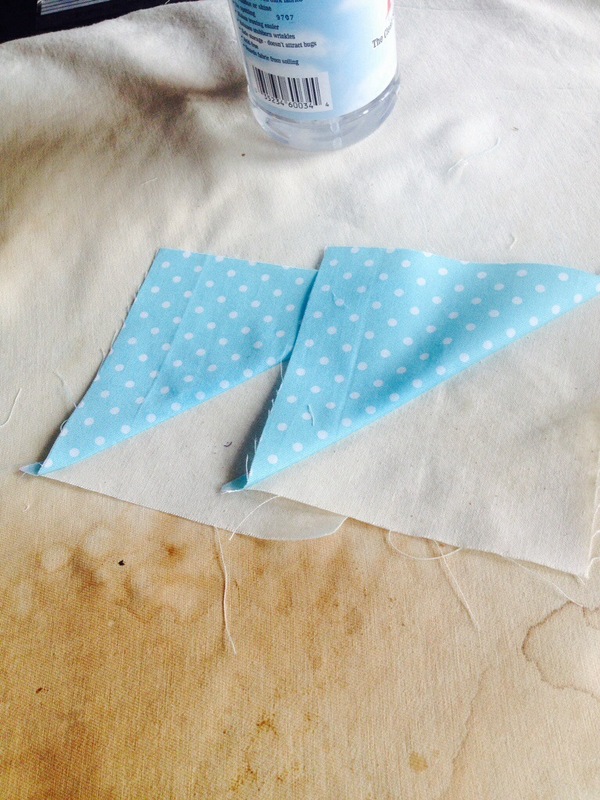 Step one: take your two squares of fabric and put the right sides together. Now here’s the mind bending part. 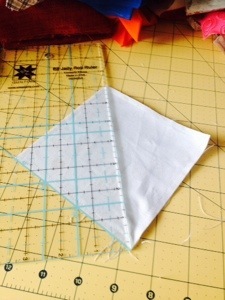 Sew 1/4″ all around the perimeter of the squares. “That’s weird,” you say. But this method is all in the cutting. 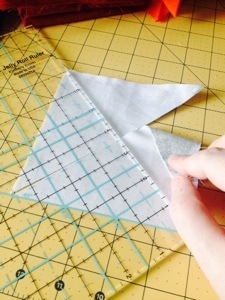 Step two: take your ruler and align the sewn squares with the 45 degree marking. Cut from corner to corner. Step three: now turn the two halves around and line them back up. Align the 45 degree marking on your ruler and cross cut from the other corner to corner. Now you’re ready to press! A brief note about pressing and both methods described: there is a lot of bias along the edges of these triangles. I recommend some kind of starch when pressing just for stability. And handle them with care as you’re working with them. Applique. This word alone can cause anxiety for quilters. 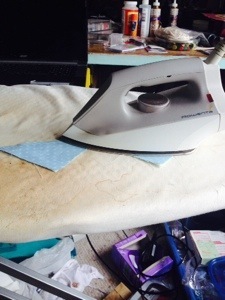 But before you grab a dose of Ativan, check out the prescription-free ways of alleviating that feeling–there are fusible web products that can hold the fabric down while you machine stitch it to the quilt. Here’s my example of the first time I ever attempted applique by machine. It was done on a Dresden plate and is a totally laughable piece of work! I made sure to add lots more interest by hand with some embroidery and hand quilting. I think the block is still cute, but I learned that I am just not a machine applique person. I see some people out there online who are just amazing at it but I…well…produce some interesting results, shall we say. Okay, so I’m not so hot with the machine. But anyone who knows me can likely understand that. I’m just better when stuff is done with my kinetic senses. So needle turn applique it is! 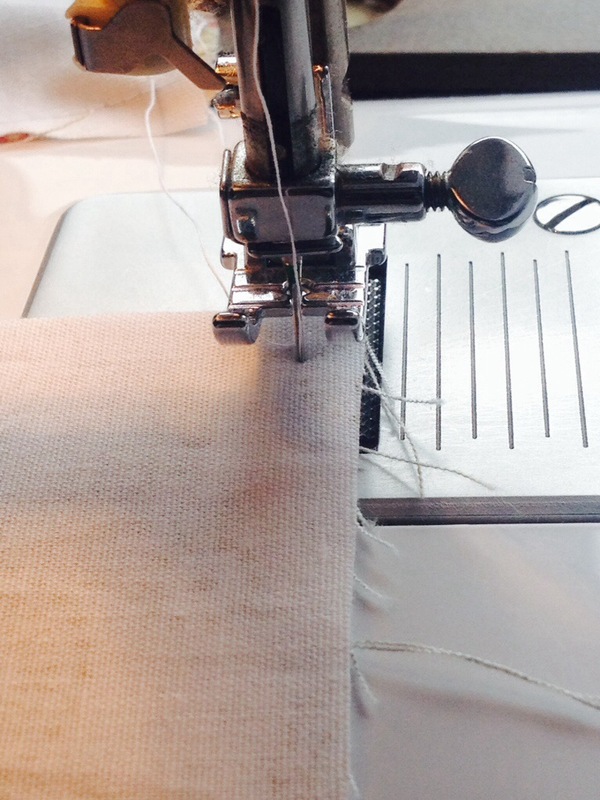 This is the only way I’ve gotten good results–invisible stitching (or barely visible). 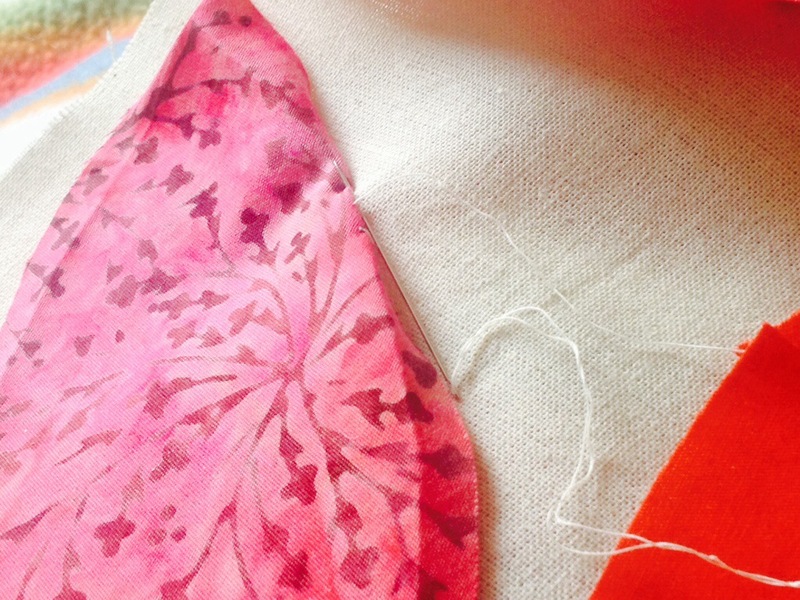 And I have a nifty secret: I don’t use an iron and seldom need those tiny applique pins. As you can see in the image below, my petal has a crease where it will fold. The trick to getting this crease is to simply pinch it in your fingers. It’s just like any other finger pressing, only you’re pinching your seam allowance. Then you have your line to follow. 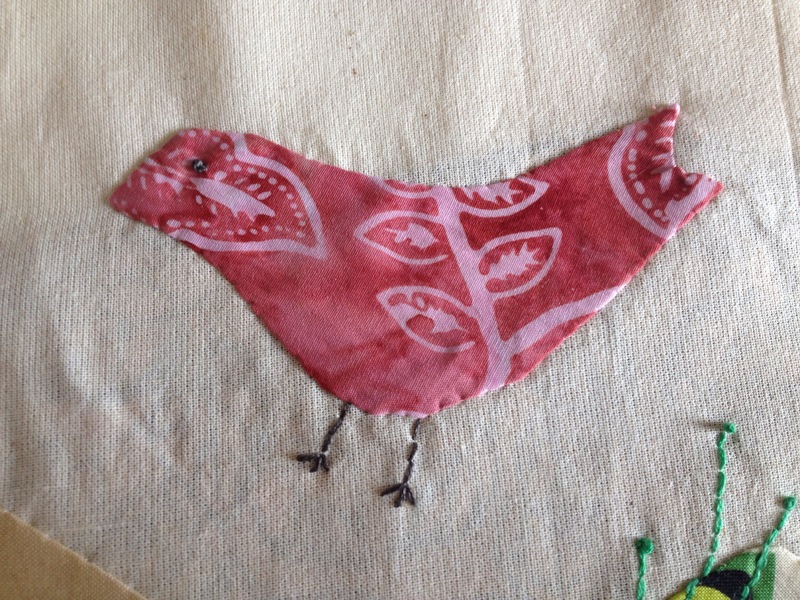 Oh, and to hold the fabric in place I use Roxanne’s applique/basting glue. It comes out in the wash and is it ever strong! Don’t bother with glue sticks! Now how to make a nice pointed petal. 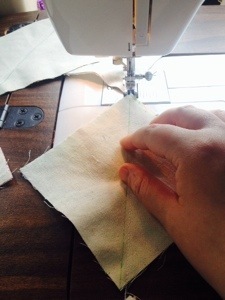 Simply stitch to the very end of your crease (where it crosses over with the crease for the other side). 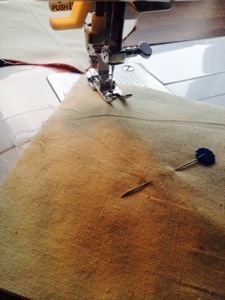 Then take your needle (be sure to use a straw/milliner’s needle for applique–much easier) and stick it in the end of your fabric and with a circular motion twist the fabric down and under itself. Make sure your doubled-up seam allowances are seated on top of each other and give the corner a slight tug to bring the point out more. Take a stitch to hold it in place and carry on down the other side! I want to make a video of how to do this so it’s as easy to grasp as possible. I promise to post that as soon as I can. 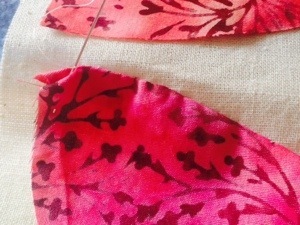 I am doing hand applique for a quilt pattern called “tuilleries.” The pattern calls for machine work but I’m just not fond of it, so here I am doing it like Frank Sinatra: “my way!” Therefore I’m not doing all the panels the same with three sets of these petals, as the pattern calls for. I am including things like butterflies, flowers, and sweet little birds. I will keep you posted on this quilt’s progress! Who could resist this sweet little bird?! I love him! Good thing I used glue drops to hold things together or Major would have ruined everything by his sitting on the applique pile. I know this post was sort of short, but lots of pictures makes up for it, I think. 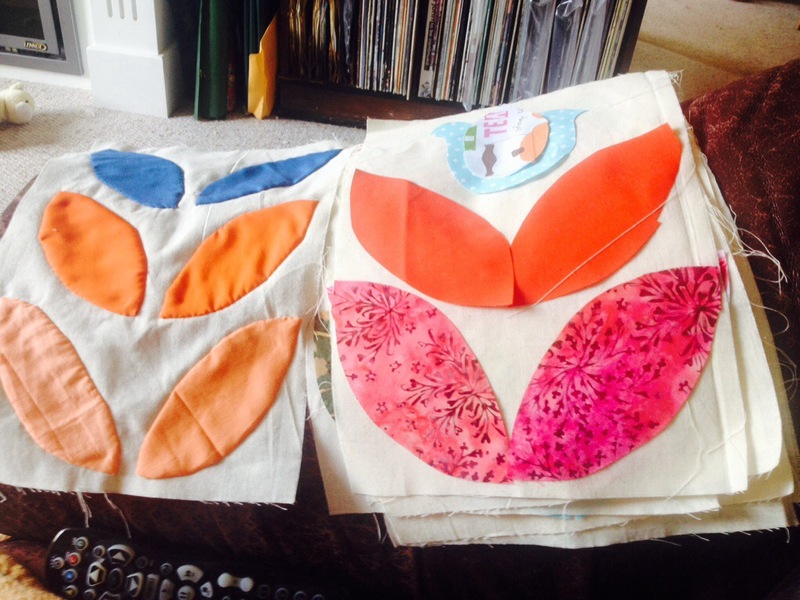 If you like the idea of any sort of applique let me know! If you have machine secrets, I’d be more than happy to hear them because even though I’ve seen it done, and even tried it a few times, I can never get it to work as well as I can by hand. Comments are welcome!! So have any of you lovely people found yourselves addicted to blocks of the month? I sure have. 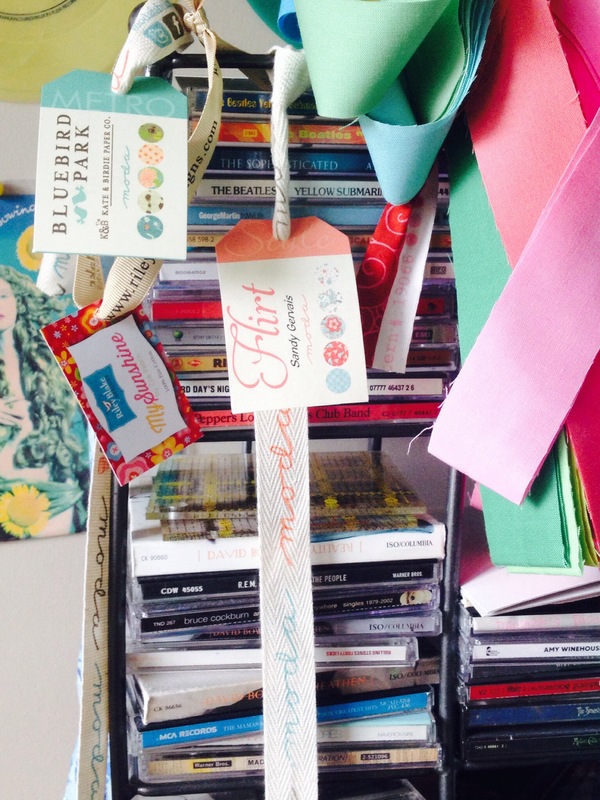 It started with the craftsy block of the month classes, which are free. Then I got into paid classes. 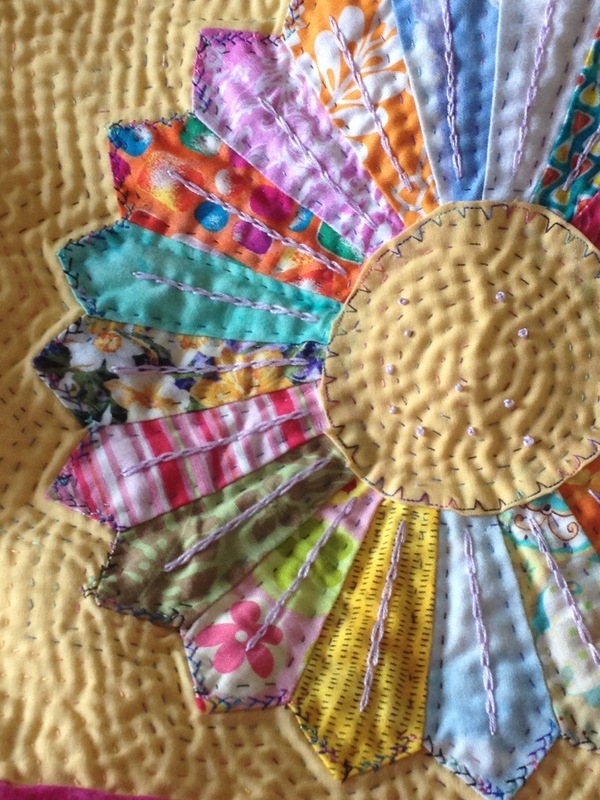 Then I found out about a great (and economical) block of the month called The Sugar Block Club, which I’m sure I’ve mentioned in previous posts. Last year’s cute blocks are in my latest sampler that I’m still quilting (it’s an oversized queen bed quilt that I’m doing by hand, so yeah. 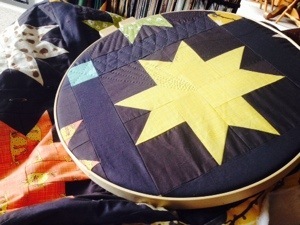 It’s been a very long time in the quilting). They came with recipes for goodies, if that’s your thing. This year’s blocks are about going “beyond the block,” so there’s recipes and reflective themes around which the blocks are designed. This month is “Presence.” I find this theme interesting, as I have joined several blocks of the month groups from all over the internet and have been having fun keeping up. By the end of the day I get a chance to read and get caught up on correspondence, whether that be email or facebook or anything else. Lately I’ve been on the phone more than usual. My grand mother was just in a serious car crash that broke her arm and killed her friend that was travelling with her. It has been very sad for us. Luckily Maria’s family went to my Nonna and told her they bore no ill will and they forgave her for what happened, even though it wasn’t her fault. We’re greatful that Nonna didn’t have another stroke from the incident’s physical and emotional strain. She suffered a stroke last year trying to help Nonno back up after he fell getting out of bed. It’s very sad and one of the hardest things in my life to sit back and witness my grand parents getting older. I mean, it’s going to happen, I get that. But my grand parents are very strong willed people. They grew up in Mussolini’s Italy. My Nonno was a very young man in the war and kept as a POW for two years in Cologne Germany after liberation while the countries were able to cobble up a rail line to get people back to where they needed to be. My Nonna is 10 years younger, but suffered in her own way at that time. She had to raise her brothers from the age of 11 after her father died of the flu. Her sisters and mother worked the field and considered her still too young and needed the house run. To this day nobody manages a house like Nonna. It is always pristine. Having said that, this concept of “presence,” as put forward by this month’s sugar block, I’m intrigued by the history of that. What is meant by that term in this case is to spend quality time with your loved ones. No screens, no divided attention. It’s funny because my grand parents wouldn’t have had the time for “quality” time either in childhood or as parents themselves. They were hard workers–and still are, as much as they can be. They still live in the same house they built in 1956. It’s a typical two storey rambling house from that era. Superficial things are different about it now, such as the vinyl siding my Nonno installed back in 1989, the “new” kitchen that was done in 1974, the carpeting that was replaced in 1986. But otherwise the place remains the same. They worked very hard to pay for that house in cash. Never had a mortgage. Nonno worked Christmas eve and Christmas day shifts at the Cominco mine for triple time so they’d have extra money. Quality time? Time spent not working was a waste for this generation. My parents were very similar to this, in a contemporary sort of way. Yes, they had a mortgage, car payments, credit card debt, the usual stuff. But because of those factors, they worked hard in their white collar jobs. Mom was a legal secretary (and still is) and my dad was (and still is) in the aviation industry. By the end of a work day, we’d sit together and have dinner, and then ask to be excused from the table and me and my sister would blast off downstairs to the TV room. My parents would stay upstairs and chat, or more commonly, watch their own TV. This was light years before the internet became ubiquitous as it is today, so TV was pretty much the only diversion of the time. I never blamed them for not spending “present” or “quality” time with us as we grew up. They were busy. Parents who care are busy. That’s how I saw it. But now I’m a parent. I am busy and I care about our daughter. So does my husband. 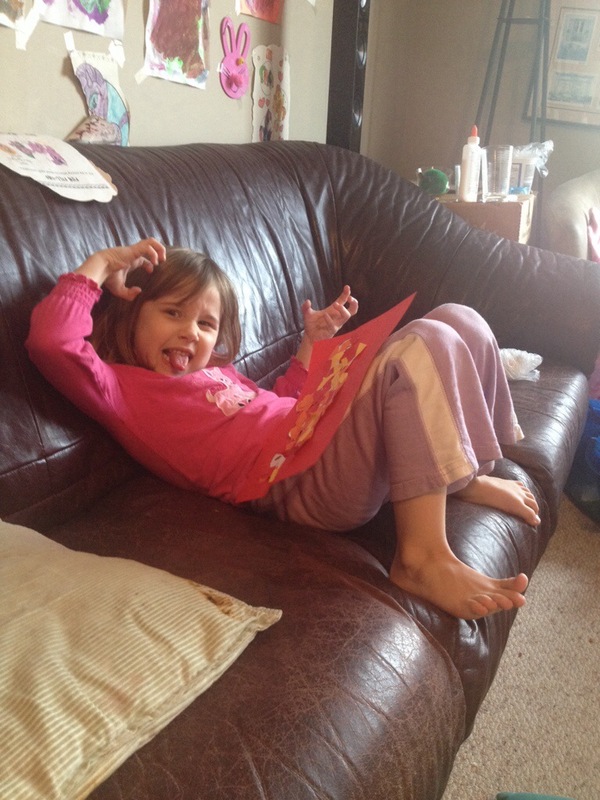 But sometimes the best way we can spend time with Bronwen is to sit and do our own things. She likes cartoons. 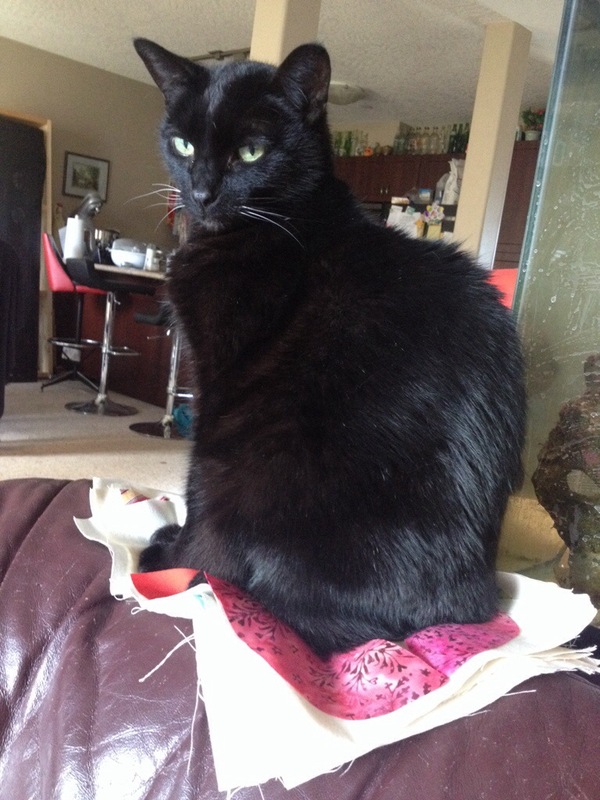 I like reading or watching craftsy classes, sitting downstairs quilting, or dashing off a block or two for my BOMs. My husband likes to play zombie games on his phone. The one thing that is “quality time” in the traditional sense is bedtime stories. We do make a point of having that. Cody and Bronwen go to the library once a week and pick out new books. When we have the extra money we buy books from those Scholastic book orders through school. So she has a healthy love of books that we are proud of. So are we “present”? Well, half way, I suppose. I think it’s a matter of finding what works with your family. I know some parents who refuse to allow their children any TV at all. The kids can only use the internet for homework, and no phones after a certain time of night. It seems like a lot of work to have a daily battle about this, especially if the kids happen to be teens. Not a battle I’d want to fight! But they do it because they want to keep the bad out as best they can. I don’t argue about it with them. I just feel like that’s the same attitude as the war on drugs or the war on terror in the States. It’s a hollow comfort for those who believe we need that kind of approach. Anyway, I hope all your families are experiencing positive time together in your own ways. Have a good week!